Students are the future leaders of a nation and the country’s progress depends on their sound health. So it is important to provide them a balanced diet regularly and to take care about their health. If healthy food can be ensured for them then they can grow up properly. Healthy food supports a student to keep both mentally and physically fit. On the other hand, unhealthy food (junk food) makes a student fatty and lead to malnutrition. The students of school, college and university stay about 8-9 hours daily in their institutes. During this period they feel hungry and frequently take junk food during lunch break.Very few students bring homemade food with them, so they have no alternate choice without taking junk food. The term junk food was originated in the early 1950s. Junk foods are processed foods consisting of high calories but cause serious malnutrition. These foods are prepared in such a way that they look appealing and are enjoyable. They are made principally of white flour and refined white sugar or syrup. For example, white bread, salted snack foods, gum, candy, sugary desserts, fried fast food, crackers, cake, ice cream soda, chocolate malted and sweetened carbonated beverages that have little or no nutritional value but are high in calories, salt and fats. Though not all fast foods are junk foods, but a great number of them are junk foods. Some foods like burgers, pizzas and tacos may alternate between junk and healthy categories depending on the ingredients, calories and process of manufacturing.The more highly processed items usually fall under the junk food category, including breakfast cereals that are mostly sugar or high-fructose corn syrup and white flour or milled corn. Junk food in its various forms is extremely popular and an integral part of modern popular culture. It is well-established that the poor eat more junk food overall than the affluent class, but the reasons for this are not clear. Junk foods are often criticized for its lack of any nutritional value. Junk food consumption results in pleasurable, likely addictive and effects in the brain. The students consuming excess junk food are more likely to suffer from health problems. Junk food can negatively impact energy levels and emotional well-being. Concerns about the negative health effects resulting from a junk food-heavy diet, especially obesity, have resulted in public health awareness campaigns and restrictions on advertising and sale in several countries. The frequent consumption of junk food increases the intake of excess fat, simple carbohydrates, and processed sugar which may lead to a higher risk of obesity and chronic diseases like cardiovascular disease, type 2 diabetes, non-alcoholic fatty liver disease and cancer. Simultaneously, consumption of junk food affects the brain in the same way as consuming addictive drugs. Consumers also tend to eat too much in one sitting, and those who have satisfied their appetite with junk food are less likely to eat healthy foods like fruit or vegetables. In addition, junk foods are often prepared in dirty and unhealthy environment in most of the restaurant and bakery. 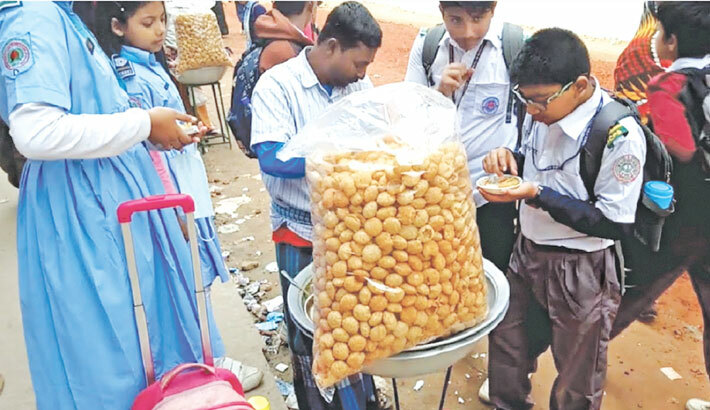 The literacy rate is still low in Bangladesh, so many parents are not aware about the bad effects of junk foods. Besides, students do not get enough knowledge from their institutes about the importance of healthy foods. As a result, they frequently take junk foods which silently erode their health. About 41% of children’s daily energy intake comes from junk food. This means junk food is taking the place of other more nutritious foods in our diets. Quitting junk food is a gradual process. If someone is accustomed to taking junk foods daily, then quitting may not be easy. The first few days could be tough as you may experience some of these symptoms: irritability, headaches, dip in energy levels and so on. An occasional treat never hurts, what you have to look out against is consistent consumption of junk foods, especially at the cost of healthy nutrition. If someone wants to lose weight then he/she must eat less junk food. Eating too much junk food is linked to serious health problems. Junk foods are not a necessary part of any diet. To keep students away from taking junk foods, parents should give homemade foods in their children’s Tiffin box when they leave for school. Educational institutes and government should also supply healthy foods for the students with reasonable price and monitor it regularly. A number of countries have adopted, or are considering, various forms of legislated action to curb junk food consumption. The writer is an M.B.B.S. student of Enam Medical College, Savar, Dhaka.